Paper towels consumed by academic and administration building occupants in 2015 totaled 28,938 lbs1. This equates to 3.4 lbs of paper towels being disposed of per person (faculty, staff & student) within the academic and administration building during the reporting year. Figures reported via Facilities Management’s bi-annual 2014 Waste Audit, which assesses the campus’ one-day waste behaviours, indicated that 29% of the material found in the waste stream audit consisted of paper towels and napkins. *2016’s audit reported 8%; however, waste from the restrooms was not collected for this year’s audit, which accounts for the majority of the paper towel disposal. The paper towel used by the campus has reached its end-of-life point. The paper material has been recycled to the point where it is at its last possible use. Sanitary concerns deem this material unacceptable for recycling and compost collection by the cleaning staff and recycling facility. Infrastructure limitations have made this material unusable in the compost system. Organic material breaks-down faster than paper material. Due to this problem, clogged systems lead to inefficient processing of the organic material. 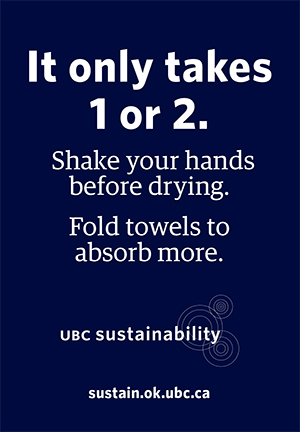 After shaking excess water off your hands, use 1 or 2 pieces paper towel – folded for best absorbency – to dry your hands. Where available, use the Dyson Airblade hand dryers found in most restroom facilities in campus. Grab 1 napkin with your meal, use another if necessary. All left over, unused napkins will end up in the garbage stream, not back in the dispenser. Reducing paper product consumption in restrooms in campus academic and administration buildings will help the University improve waste production and diversion efficiencies and achieve reductions in material consumption and associated costs. Our collective actions to manage material consumption will make a difference. The Sustainability Office encourages all campus constituents do their part to reduce waste and minimize the campus’ environmental footprint through waste reduction practices. For more information contact us. 1 Reported figures provided by BEST Service Pros. Calculation completed via Cascades Tissue Group software. 2 Municipal Solid Waste and Greenhouse Gases. Government of Canada, Environment and Climate Change Canada. July 2014.